I love my public library. No, I mean I loveeeee [insert expletive] that place. I’m there 1-2 times a week. And, even as I write this, I want to make a library run. Depending on how sunny it is outside; that place is one of the first stops I like to get out to. Skip the lunch date, eh? Well, unless it's with somebody cute and interesting to talk to. As well as more engaging than a book. Anyway, there are thousands of reasons why I (and everyone else I hope) love his or her public library. Yet, I wanted to talk about one superficial and simple reason why I love library books themselves. We’ll consider this an off-beat and celebrator post on library book love. 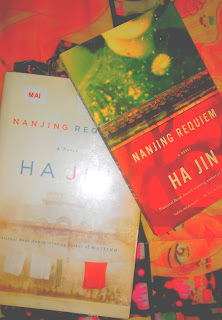 Recently, with purpose, I shelved my trade paperback copy of Nanjing Requiem by Ha Jin. Why? Because I favored my library’s hardback copy. 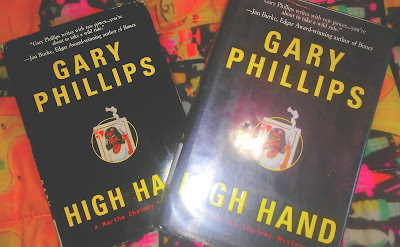 Beforehand, I couldn’t read my book club edition copy of Gary Phillips’ High Hand. So, instead, checked out my library’s copy. It boils down to loving that crackling of protective mylar. I get a buzz everything it sounds off. And I indulge in the comfort of reading a book that’s already broken into. And yes with coffee, food, lipstick, and other stains aside. There's something almost divine about holding a book that has circulated through many hands. Grant I’m a germaphobe and keep hand sanitizer at the ready. And, well, hardcovers are generally comfortable on the eyes as is. So yeah. I’ll go out of my way for the slightest moments of blissful reading. As a nerd and bookworm, one can't help thyself.